The Salem Bicycle Club was formed in 1969 for the purpose of promoting recreational bicycle tours in the local area. Over the years, bicycle advocacy for improved biking conditions has been a priority as well. Since formation of the Salem Bicycle Club, it has grown to more than 400 members. The club supports the advocacy work of the League of American Bicyclists. The club schedules weekly rides each weekend throughout the year. During the summer, the club also schedules week day evening rides and overnight rides. Ride distances range from 15 to 100 miles. Many routes are specially designed for novices. Non-members are welcome on club rides. All rides have assigned ride coordinators. Each ride participant must sign a release and waiver of liability before the ride and must wear a helmet meeting CPSC requirements. The club annually sponsors two event rides which are widely publicized and draw cyclists from throughout the Northwest. These rides are the Monster Cookie Metric Century Bicycle Ride on the last Sunday in April and the Peach of a Century in late August. The club's newsletter, Spokes, is published 10 times each year. The newsletter provides members with the monthly rides list and includes other information and articles of interest to local bicyclists. The current and past issues of the newsletter and information on how to submit articles for publication are available on-line. Monthly club meetings include programs on bicycle maintenance and repair, bicycle touring, health and exercise, riding law, and safety. Meetings are held on the 4th Tuesday of each month except December and January and start with a social half-hour at 6:30 p.m.
Jim Ross is club president. Winnie Sangirardi is membership coordinator. The Salem Bicycle Club's snail-mail address is P.O. Box 2224, Salem, OR 97308. For information about joining the club, see the Membership page. The Salem Bicycle Club is a Ride with GPS area route Ambassador. The program helps cyclists from around the world find great places to ride when visiting our area. Currently, we only have one route listed under the Ambassador program, but there's more to come. Contact the SBC webmaster with ideas for other routes. 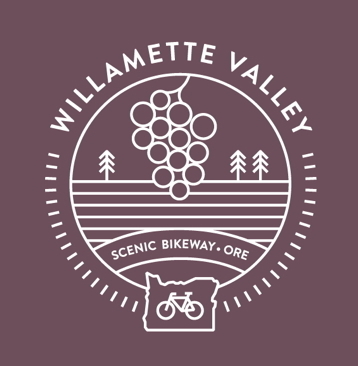 Salem and Keizer are on the Willamette Valley Scenic Bikeway. Check it out, or take a look at all seventeen Scenic Bikeways that have been designated under Oregon's first-and-only scenic bikeway program in the nation.